In the past audition of Britain's Got Talent show, a Golden Buzzer was pressed once again! This time, under the direction of a strict judge Simon Cowell, who gave a 39-year-old comedian Kojo Anim free ticket to semi-finals. On the talent stage, Kojo fairly laughed the audience, and when the results were announced, he fell to the ground and started crying. Kojo Anim first made a joke about his father's behaviour, then he also talked about bank employees and taxi drivers. His performance impressed everyone in the hall, and at the end, everyone was applauding him. Kojo Anim had been performing comedy in one of the London's pubs for 20 years, and now he has gained fame thanks to the strict Simon Cowell. At the end of the show, he told him that he doesn't like comedians on the stage of talent, but that he was something special. 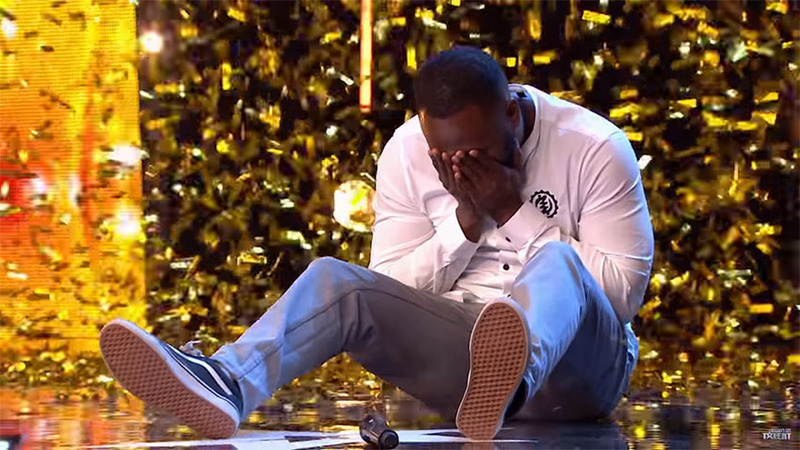 He pressed the Golden Buzzer, with which Kojo ranks straight into the semi-finals of a popular show. He cried of happiness during the annonucment. Take a look at his show and enjoy the dose of humor!